A gift certificate template is a great way to make a professional quality gift certificate to hand out to a favorite employee, customers, friends, or special acquaintances. The fact is that making a certificate from scratch is very difficult. Buying software to create the certificate could wind up costing more than a budget would allow. 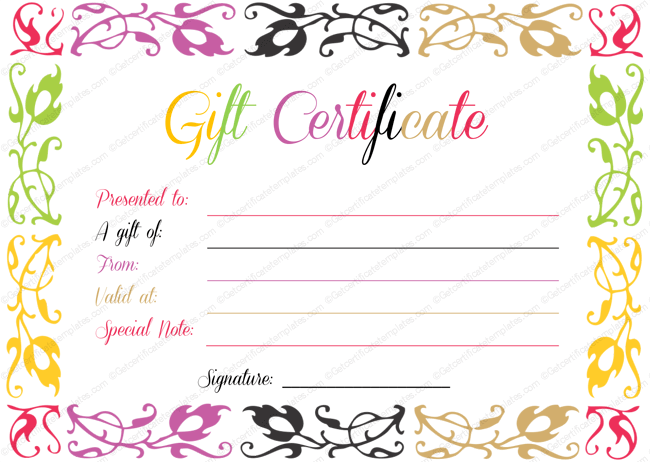 Take a look at this professional quality gift certificate template. It is easy to download right to your computer and to get started customizing all the details. A few minutes later, it is easy to print out your own professional quality gift certificate. The certificate is beautiful and an elegant hand writing design. However, it is easy to customize. Change the colors or even change the font. Add the information to the fields or even change the number of fields that are included on the certificate. Get started now. Download to your computer. No fancy graphics or software is required.